Reusable and easy to handle, the Green Vista Deluxe Multi Use Net / Netting 60% Green Shade Cloth and Visual Block provides relief from the sun and makes areas more private. Use it over a garden, in a greenhouse or to cover a porch or dog pen. In addition to blocking 60 percent of sunlight and serving as a privacy screen, this material also blocks debris, including small fallen leaves. The knitted netting can be stretched across a pond, swimming pool or other water feature and secured with rocks or pins, effectively saving you hours of leaf and debris cleanup each autumn. This versatile net also protects vegetables, fruit, flowers and ornamental plants from birds and other animal pests looking for a meal. Made of high quality polyurethane, this green net will not unravel when cut. Additionally, its resistance to ultraviolet light's damaging effects give it a longer life. Although this durable netting does not have taped edges and grommets as shipped, plastic fabric grommets (clips) can be used, if desired, to allow its easy connection to a frame or structure. Protect people, pets, plants, ponds and pools with the Green Vista Deluxe Multi Use Net / Netting 60% Green Shade Cloth and Visual Block. Click "Add to Cart" now. 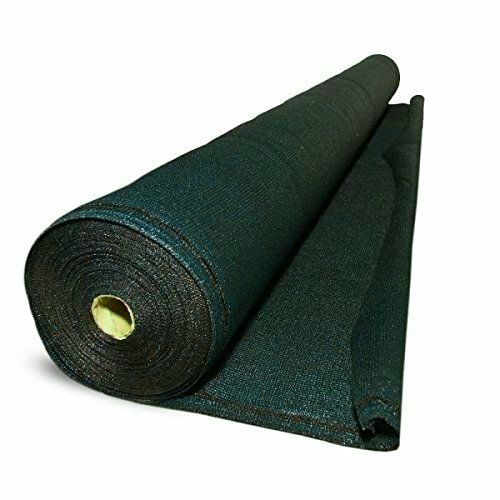 CUTS 60% OF SUNLIGHT AND PROVIDES PRIVACY: The Green Vista Deluxe 6 Feet x 20 Feet Multi Use Net / Netting 60% Green Shade Cloth and Visual Block provides shading and privacy screening for patios, gardens, greenhouses, ponds, swimming pools, pet pens and other areas. It also can be used as bird netting to protect fruits and vegetables, and it has many other purposes. This effective netting keeps out 60 percent of light. ALLOWS AIRFLOW YET BLOCKS DEBRIS: The small mesh of this green netting keeps even the smallest fallen leaves out of porches, water features and gardens. It also prevents other debris from getting where it is not wanted. Using it saves you the time of cleaning out the location it protects. PROVIDES LASTING STRENGTH: This net is specially knitted from high quality polyurethane. Even though it is strong, it is easy to handle. RESISTS UV LIGHT DAMAGE: Its polyurethane material makes this shade cloth resistant to ultraviolet light's harmful effects. That feature helps the netting last longer. IS REUSABLE AND DOES NOT UNRAVEL WHEN CUT: This knitted netting can be trimmed to size easily and does not unravel like a woven net. Simply use scissors to cut it to the desired dimensions. If you have any questions about this product by Green Vista Water Gardens, contact us by completing and submitting the form below. If you are looking for a specif part number, please include it with your message.